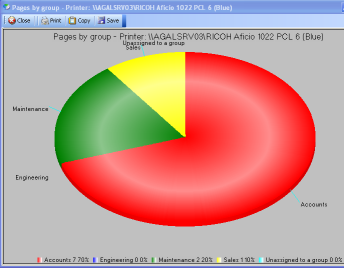 PrintTrak printer cost control made easy. PrintTrak is a cost effective print logging and accounting; solution in situations such as businesses, libraries, internet cafes and schools/universities where print costs need to be monitored and/or recovered. PrintTrak monitors print jobs being sent to printers, recording details such as the user who sent the job, the name of the job and the number of pages printed for a the print job. Charging schemes can be easily set for each printer and users can be put into functional groups or classes. 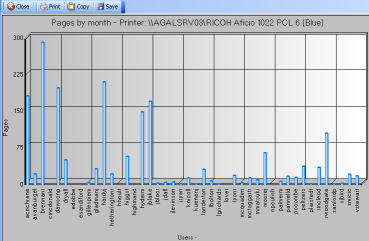 PrintTrak 2.40 released See the versions page for more details. · Instant cost recovery: In situations such as print shops or internet cafes where customers are charged for printing as it is performed, PrintTrak can log the performed jobs, calculate charges and produce invoices instantly. · Recovering consumable costs: Often, the owner of the printer is responsible for supplying the consumables such as ink, toner and paper, and financing any repairs to the printer. By charging the users for their print jobs, funds are then available for these ongoing expenses. Staff in many workplaces are required to record the number of pages printed etc manually on an appropriate form as an attempt to recover costs. However, comparisons between manual and electronic records at several sites have shown an honesty rate of only about 13%. That is, 87% of the jobs printed are never logged manually. · Recovering capital costs: When a printer breaks down or is in need of replacement, it can often be difficult to find someone who is willing to cover the cost. PrintTrak can display exactly who prints what proportion of jobs and therfore will clearly show the primary users and who should be financing these costs. PrintTrak will also print this data in chart form to demonstrate use even more clearly. · Monitor what is being printed: Because PrintTrak keeps logs of the filenames that are being printed, it also displays the filenames of any undesirable or unauthorised documents which may have been printed. 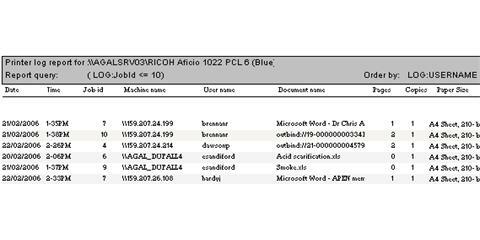 · Security: Printer access permissions are usually set up on the printer server, but by browsing the print logs it is easy to establish if unauthorised users are accessing a printer. · Curiosity: It is sometimes benficial to see exactly what a printer is being used for. · Operating System: PrintTrak will not run on Windows98 or lower as the necessary API's are not present, however the print jobs coming from Windows98 or lower machines (or linux/mac) can be monitored. Consumables for some printers can be very expensive. At one particular site a Hewlet Packard 8550 color laser printer at a capital cost of around $15 000 was being used centrally. This machine uses 4 different toner cartridges (magenta,yellow,cyan and black) which cost around $150 each to replace. The cost in toner alone was $5 400 per annum, but with manual recording the amount recovered was only $2 100 per annum. Naturally the shortfall had to be found from somewhere, in this case the department of the 'owner' of the printer. As this was unacceptable, a software solution was sought to cover these requirements - to identify the owner of a print job and to be able to split the owners into groups for billing. As there appeared to be no suitable software available commercially, the first version of PrintTrak was developed. When applied to this particular site the software cost (the cost for PrintTrak) was recoverd in just 7.6 hours, and a profit of about $6 800 per annum was attained and set aside for printer maintainance and replacement. PrintTrak has now been refined and installed at another eight test sites. The results have varied, but the maximum payback time on the capital cost of the software was 4 days. 1· Select a printer for logging to just view print jobs being sent to a printer. 2· Set up charging parameters for a printer if print jobs need to be charged for. 3· Create groups and assign people to them if print jobs need to be charged for groups. People are automatically added by username as the first print job they send is recorded. Or they can be added in bulk if there is an active directory or domain controller present. The latter is useful for splitting people into groups in one step, rather than having to wait for them to be assigned individually as they print. 4· Set up email server parameters, and set the automatic email properties for each printer if email reports of printer usage at specified intervals are required. If PrintTrak is set up correctly it becomes a set and forget system. Jobs are automatically recorded and reports are sent out to the appropriate people at specified intervals. PrintTrak now uses a client/server technology where logger clients collect print logs and send them across the network to a logging server. This configuration allows for great flexibility in logging configurations, direct network connected printers can easily be logged and logs can be sent across a LAN, WAN or even the internet. If it doesn't work for you - we want it back! At LyGil Software we believe in happy customers. We believe all our products do their job, and do it well. But we're realistic enough to know that our software isn't going to fit every situation. That's why we have a strong Refund policy. If you have some or all the requirements mentioned above, then we are certain that PrintTrak can be applied to your particular situation and that it will become an invaluable and profitable tool.